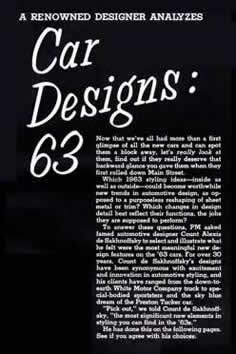 A Renowned Designer Analyzes Car Designs: 63 – Now that we've all had more than a first glimpse of all the new cars and can spot them a block away, let's really look at them, find out if they really deserve that backward glance you gave them when they first rolled down Main Street. Which 1963 styling ideas - inside as well as outside - could become worthwhile new trends in automotive design, as opposed to a purposeless reshaping of sheet metal or trim? 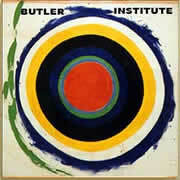 Which changes in design detail best reflect their functions, the jobs they are supposed to perform? 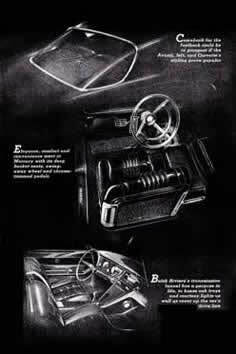 To answer these questions, Popular Mechanics asked famed automotive designer Count Alexis de Sakhnoffsky to select and illustrate what he felt were the most meaningful design features on the '63 cars. For over 30 years, Count de Sakhnoffsky's designs have been synonymous with excitement and innovation in automotive styling, and his clients have ranged from the down-to-earth White Motor Company truck to special-bodied sportsters and the sky blue dream of the Preston Tucker car. "Pick out," we told Count de Sakhnoffsky, "the most significant new elements in styling you can find in the '63s." He has done this on the following pages. See if you agree with his choices. Text for the introduction is at the top of the page. Text for panels 2-6 is under the corresponding panel. The 1963 Studebaker Avanti is illustrated four times: The front end in panel 2, the rear window in panel 3, the interior in panel 5, and the rear in panel 6. 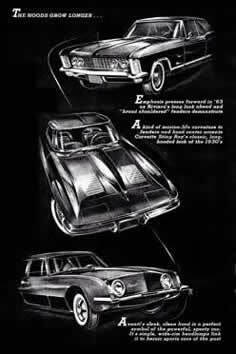 Also illustrated are Riviera, Corvette, Mercury, an experimental Mustang, Valiant, Plymouth Fury, Pontiac, Lincoln, Olds and a Lark Waogonaire. The Hoods Grow Longer . . . 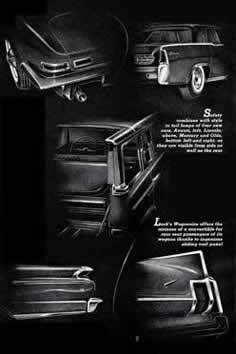 Emphasis presses forward in '63 as Riviera's long look ahead and "broad shouldered" fenders demonstrate. A kind of marine life curvature to fenders and hood accents Corvette Sting Ray's classic, long-hooded look of the 1930s. Avanti's sleek, clean hood is a perfect symbol of the powerful, sporty car. Its single, wide rim headlamps link it to heroic sports cars of the past. Comeback for the fastback could be in prospect if the Avanti, left, and Corvette's styling prove popular. Elegance, comfort and convenience meet in Mercury with its deep bucket seats, swing-away wheel and chrome-trimmed pedals. Buick Riviera's transmission tunnel has a purpose in life, to house ash trays and courtesy lights as well as cover up the car's drive train. Ford's experimental Mustang could be a trend setter in sports car styling with its engine behind driver's seat and needle-nosed, snub-tailed lines. 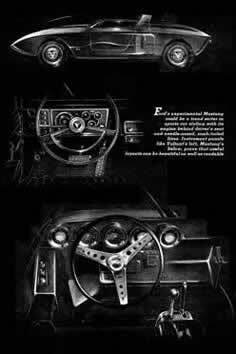 Instrument panels like Valiant's left, Mustang's below, prove that useful layouts can be beautiful as well as readable. Overhead switches on Avanti are practical as they reduce clutter on lower panel and keep driver's eyes near the road. 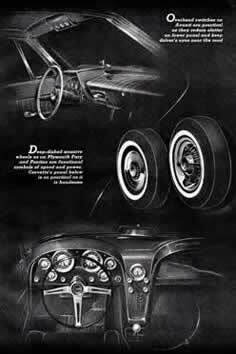 Deep-dished massive wheels as on Plymouth Fury and Pontiac are functional symbols of speed and power. Corvette's panel below is as practical as it is handsome. Safety combines with style in tail lamps of four new cars, Avanti, left, Lincoln, above, Mercury and Olds, bottom left and right, as they are visible from side as well as the rear. Lark's Wagonaire offers the airiness of a convertible for rear seat passengers of its wagons thanks to ingeniuos sliding roof panel.